As one might expect considering his relatively meager production as a freshman at UCLA, Zach Lavine's situational profile doesn't paint a pretty picture. Using 9.7 possessions per-game, he ranks as the lowest usage player in this group, and as the least efficient scorer in both one-on-one and pick and roll situations. On the positive side, LaVine's athleticism shows here, as 32.1% of his possessions came in transition, more than any other player, and while he scored an above average 1.148 points per-catch and shoot jump shot, the team drafting him probably won't be overly concerned with how he looked on paper this past season as focused as they'll be on putting him in position to reach his lofty potential a few years from now. A detailed video analysis by Mike Schmitz of how Zach Lavine performed without Jordan Adams and Kyle Anderson on the floor this season. We joined Zach LaVine as he works out in preparation for the 2014 NBA Draft, and discussed a number of topics with him, including what he's trying to improve on in the short-term and what he feels he can bring to a NBA team. Zach Lavine: While showcasing his athletic ability, Lavine also helped himself in the measurement realm as he measured 6-5 ¾ with shoes, a 2 ¾ inch increase from 2012 when he measured only 6-3 in shoes at LeBron James Camp. Lavine was seen as an undersized two-guard for much of the year, but with his new measurement he has more than adequate size at the shooting guard position. Although not quite as long, Lavine compares physically to Jamal Crawford (6-5 ½ in shoes, 175 pounds and a 6-10 wingspan). Zach LaVine came out of nowhere early on in the season and emerged as a productive shooter and finisher for UCLA. Although he cooled off significantly as the year moved on, LaVine decided to take advantage of the attention he garnered early on in the season and declared for the draft shortly after playing his final game in a UCLA jersey. How good of a prospect is LaVine, and is he worth taking a flyer on in the first round despite being a long ways away from being able to contribute? The appeal around LaVine revolves heavily around his tremendous athleticism, as he's one of the most explosive open court dunkers in college basketball. He's an amazing leaper off one foot, and also possesses a dynamic first step and great quickness in the open floor. LaVine will likely test about as well as any player athletically at the NBA Combine, which undoubtedly gives him significant potential to continue to improve as his career moves on. LaVine is also an impressive shot-maker, sporting unorthodox mechanics but looking very confident in his shooting stroke, be it with his feet set, pulling up off the dribble, or even coming off screens. The ball comes out of his hand very smoothly and he has deep range and a quick release on his jumper. LaVine started off the season in very impressive fashion, making 42 of his 97 3-point attempts (43%) in the first three and a half months, but then tallied off quite a bit in his final month in college, making just 6 of his last 31 attempts (19%), which brought down his season percentage to a still decent 37.5%. Besides making spot-up jumpers and coming off screens, LaVine's only other real source of offensive production comes in transition, where he sees a significant share of his possessions. His terrific quickness allows him to leak out and make impressive plays in the open floor, and he's quite a handful to deal with in early-offense situations when opposing defenses aren't set thanks to his tremendous burst and leaping ability. Where LaVine struggled this season was when he was forced to take more responsibility upon himself and create offense in the half-court in pick and roll or one on one situations. He's just an average ball-handler, as he doesn't do a great job of reading defenses and playing at different speeds, and struggles badly finishing through contact around the basket, particularly with his left hand. LaVine made just 17 shots around the basket in the half-court this season in 37 games, and did so inefficiently at that, only hitting 45% of his attempts in these situations. He only got to the free throw line 2.8 times per-40 minutes pace adjusted, which rates dead last among all college players in our Top-100 prospect rankings. LaVine's feel for the game and decision making skills leave a lot to be desired at this point in time, as his shot-selection can be very poor and he has a difficult time making the simple play at times. His propensity for settling for long 2-point jumpers hurts his efficiency, and he doesn't do a great job of creating for teammates, as all his passing metrics are poor even for a wing prospect. He generates an assist for a teammate on just 13% of his possessions (18th best of the 22 SGs in our Top-100), and dished out 2.8 assists per-40 pace adjusted, which also ranks similarly among SG prospects. To his credit, LaVine does a good job of not turning the ball over too often, coughing the ball up on 12% of his possessions (11th best of the 22 SGs in our Top-100), which helped him post an acceptable PPR (.21) and assist to turnover ratio (1.57). When LaVine puts the ball on the floor, it's mostly to shoot a pull-up jumper, which helps him keep the turnovers to a minimum. Somewhere along the line a narrative developed about LaVine possibly projecting as a point guard down the road, but after watching him in high school and at UCLA, it's difficult to see where that came from. LaVine's lack of strength plays a significant role in his issues creating shots inside the paint and converting around the rim, but he will have to improve his toughness as well. He tends to shy away from contact, something that shows up noticeably on the other end of the floor too, where he struggles badly. LaVine is simply not a good defender at this point in time. He has quick feet and hands, but is not fundamentally sound, rarely getting in an actual defensive stance and showing average intensity at best. Sporting average size, length and strength, LaVine will have to improve his toughness and effort level in the NBA to not emerge as a liability on this end of the floor. Something that will work in LaVine's favor in the draft is his youth, as he just turned 19 last March, and is thus one of the youngest players in this draft class. He should improve on some of his weaknesses as his body matures and he gains more experience. 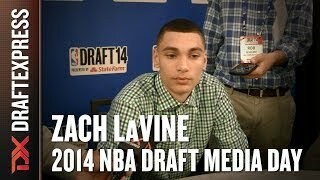 LaVine is nowhere close to being able to contribute to a NBA team at this point, but with his athleticism and shooting ability, someone in the latter part of the first round might decide to roll the dice on him and see if they can mold him into a useful player down the road, similar to what Oklahoma City is attempting to do with Jeremy Lamb thanks to their D-League team. We've taken a more visual look at his strengths and weaknesses thanks to game film from UCLA in the following video scouting report, courtesy of Mike Schmitz.